So I barreled ahead and finished it! Have to say that I had my doubts during parts of the process on this one but in the end, it all seemed to be all right. I am quite pleased with the results and I hope that everyone else likes it as well. Great show! Can't wait for new episodes. 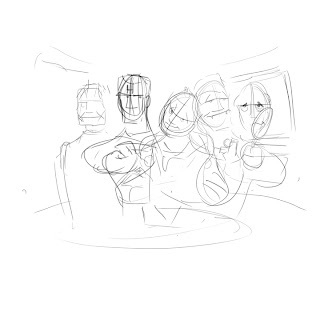 And as promised, the time-lapse video. Enjoy! I got WAY sidetracked from the next installment of the Master series. I will get back to that. I promise! 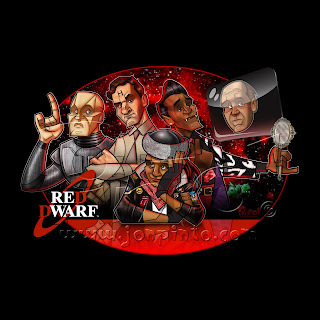 I recently watched the entire series of Red Dwarf! I have seen some of it before way back in college but I have never seen the beginning or the end of the run. I have now! So while I am continuing to toil away on the finished product (it's almost done), I thought I would share the first three sketch stages. 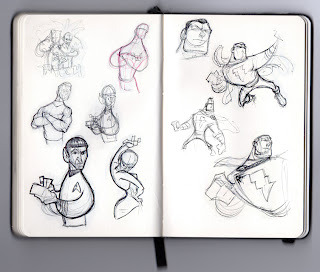 Eagle eyed readers may have noticed some of the preliminary work in my sketchbook posting. The final posting will have a timeline movie clip as well. Promise! Update 7/14/11: Just wanted to share the inked art as well as the painting in progress. So since I am not done with several pics that are in progress and I had an itch to post something, I thought I would give you another rare glimpse into my crappy sketchbook. I don't really know why I continue to demonstrate that I don't have one of those marvelous tomes filled with gorgeous renderings like other blogs show you to great excess. I believe that in some way it keeps me humble with my meager abilities. Just as a little bonus tho, there is s preview of an up and coming picture contained within. Plus, sharp eyes may recognize some doodles of older postings.